Whenever someone is launching a website ususally they want to be able to know how many people are visiting it, what pages they are visiting, and where those visitors are coming from. Almos always the default answer to this is Google Analytics. Which is this insanely powerful analytics platform that can give you insights into just about every part of your website. For free. Whenever something is very powerful, it tends to also get complex. So when Joe Site Owner wants to know “how many people visited my site today” there are some cases where this can be a hard number to get out of Google Analytics for those unfarmilar. I won’t even mention all the other seemingly basic pieces of data that require long paths of clicks just to get to the basic report, then having to drill down. Don’t get me wrong, Google Analytics totally has it’s place and for some sites it is totally worth it, on many though it is just overkill. So, what now? Without the one go to analytics platform used by nearly everyone for almost everything, what do you use? 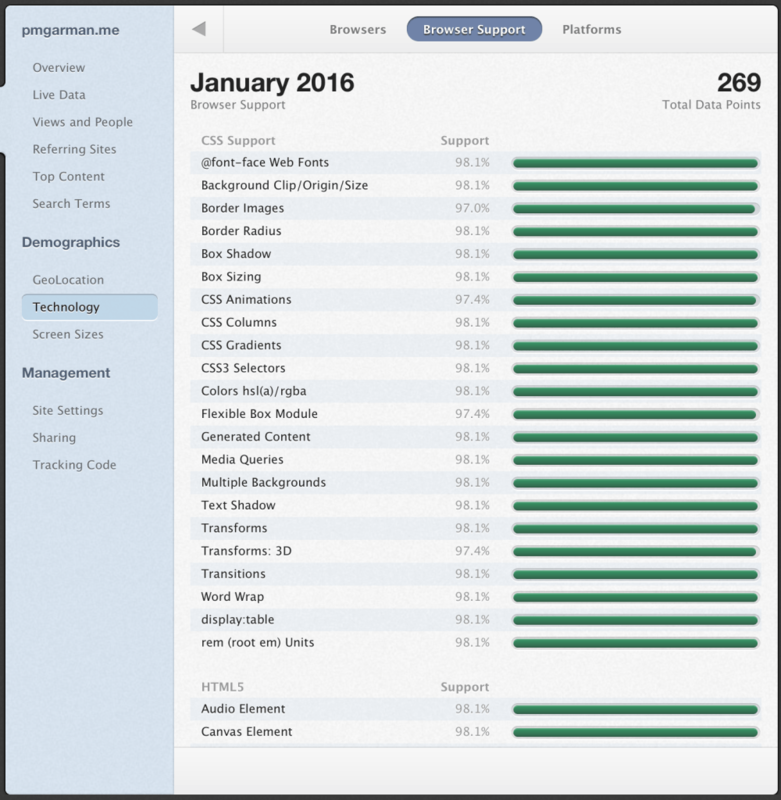 Personally – I use Gaug.es for sites where I do not need more advanced and complex analytics. They were previously a product owned by GitHub, if you need some validation before looking closer at them. Take a look at the screenshot below, it would be hard to create a simpler interface. 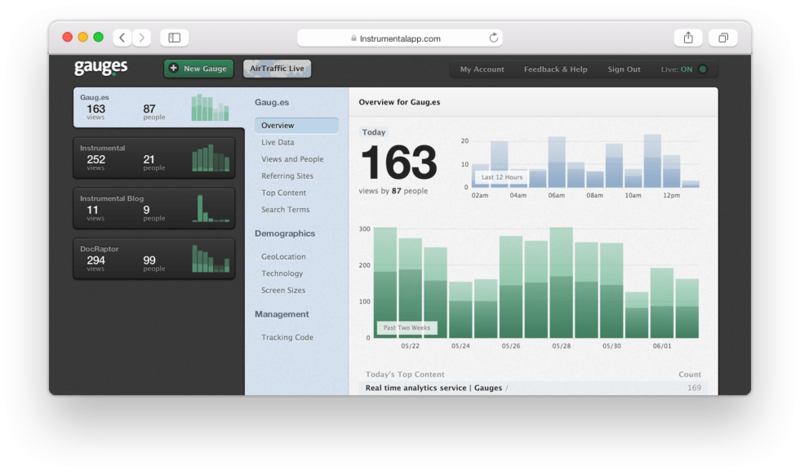 An interface where you can login, and just get the data you are wanting right away. Then it has some more advanced tools which are really useful for developers. Screen sizes is fairly self explainatory, a breakdown of the resolutions of screens of your visitors. With this you can get a quick idea of how important say a responsive site would be to your visitors. Technology is a bit cooler. To start with you can get a breakdown of the browsers and operating systems that your visitors are using, but it takes things one step further. 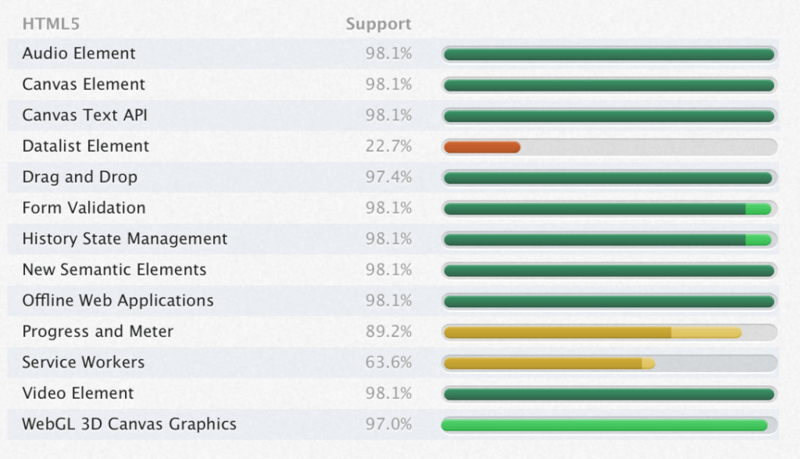 You can at a glance see how many of your visitors browsers support various web technologies. I quickly know that if I wanted to use the canvas element on this site, it would be a safe move. However many visitors would have a hard time with the datalist element. If you are using something other than Google Analytics for analytics, leave a comment below with what you are using.